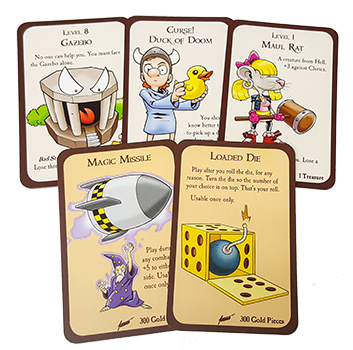 This spring marks the release of Munchkin Guest Artist Edition by Edwin Huang. Edwin is known for his work on Skullkickers, Munchkin Skullkickers, and Street Fighter. His unique art is some of the most dynamic and crisp that we've seen in a Munchkin game, and I wanted to give you a taste before you get the main course. At great peril, I have infiltrated our production department and purloined an early copy of the game. Now I have about 20 minutes until Bridget finds me. So let's take a look in the box! I've highlighted some of the major components in the game that show off Edwin's amazing art, including the board, cards, and standies. You get 12 standies in male and female portraits, in six colors, using some of the coolest art. I am a personal fan of his take on Gentleman's Club! The board is, of course, unique to this game, and highlights one of the stars of the show: Spyke! 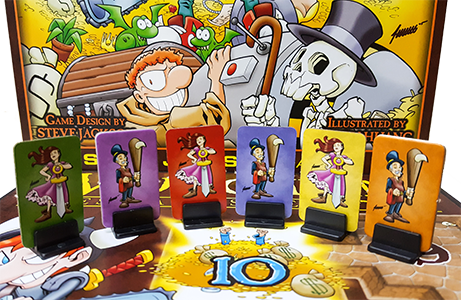 Like many of our other Guest Artist Editions, having a board means that this is the perfect game to add to your other core-sized Munchkin sets and expansions, since you're getting a load of cards, plus a board and all the trimmings to enhance your game. Edwin's illustrations are just the icing on that cake! Last but not least, we have what many of you are waiting for: the cards! Each Guest Artist has his own take on the game, and Edwin was in a position to reinvent the original. And he really knocked it out of the park! His version of Loaded Die gives us a new twist on the wordplay, and his experience as an action-oriented artist really shines on a card like Magic Missile. Yet his Gazebo keeps the imagery intact, with his own style, which longtime fans will appreciate. The Maul Rat is punkier than ever, and Spyke still hasn't learned to leave the Duck of Doom alone! As you can see, Edwin has really made this edition his own. 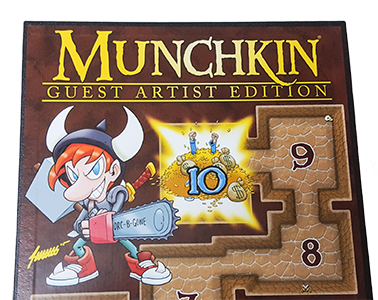 If you're a fan of the original game and want a change of pace, or a new player who wants a great starting point, check out Munchkin Guest Artist Edition this spring. You can also look at our interview with Jim Zub, collaborator with Edwin on Skullkickers, to get some more insight. Oh, hey Bridget, how's it going? Why do you have that Chainsaw of Bloody Dismemberment?